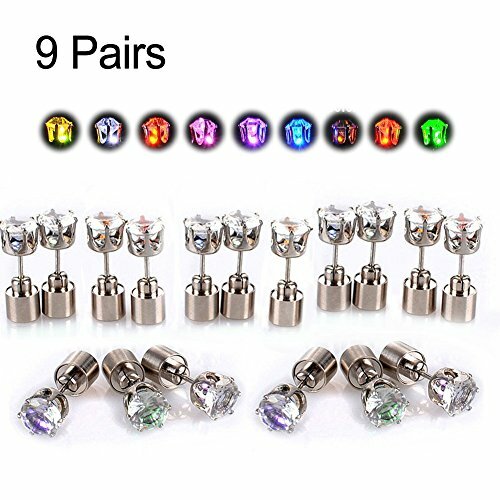 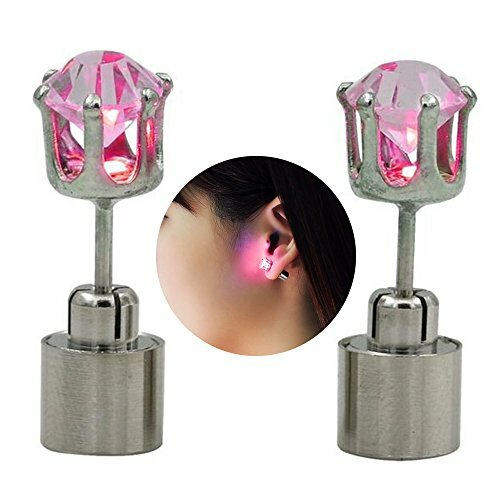 Great accessories for concerts, sporting events, holidays, costumes, nightclubs, bar and dance party.Turn on:Push the earring through your earlobe's pre-pierced hole and firmly attach the other half on back;Turn off: Pull out the post slightly. 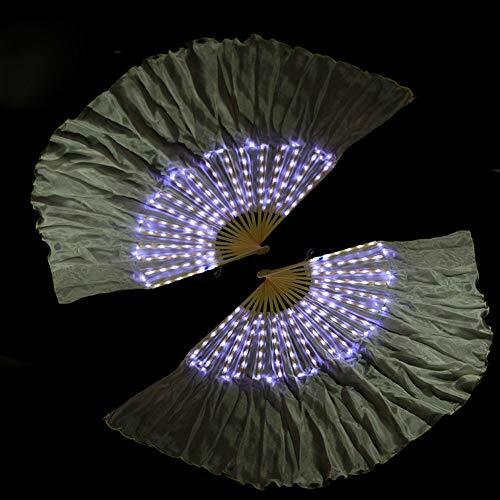 Unique design,Safe low voltage,Easy to use.Perfect for Belly dance,shows,annual fancy-dress rave,carnival,stage, Halloween party,Christmas outfits,photography etc.HOW TO USE:Put the lithium batteries into the battery case, then turn on the led light, enjoy your stage.Type: belly dance led fan veil Colour: ColorfulMaterial: 100% Silk, Natural Strong Bamboo.Size: about 180cm*90cm.Attention: No batteries, Hand made items, Do not wash.NOTICE:Do not expose to excessive heat, keep away from fire.Not recommended for children.Remove batteries when not in use.Keep dry, do not wash.Use gentle, Don't pull/crush wires or lay objects on it, flowingRegularly check the electricity, and replacement of new batteries timely. 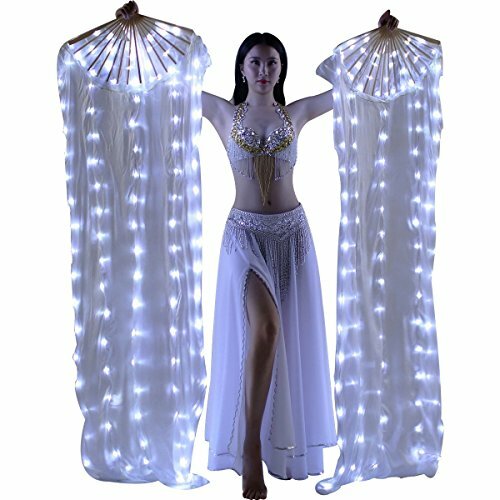 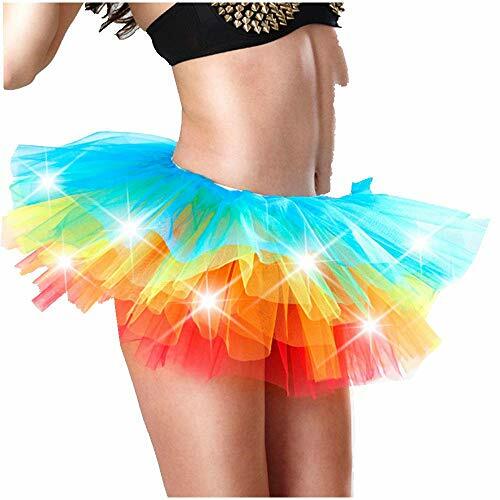 NAME:Belly dancing LED silk fanUnique design,Safe low voltage,Easy to use.Perfect for Belly dance,shows,annual fancy-dress rave,carnival,stage, Halloween party,Christmas outfits,photography etc.HOW TO USE:Put the lithium batteries into the battery case, then turn on the led light, enjoy your stage.MATERIAL:polyester+LedSIZE: The bamboo ribs length 11.8 inches(30cm),The silk veil's length 65 inches（165cm）,The silk veil's width 22 inches(56cm).WHAT YOU GET:2 x Belly dancing LED silk fan( Batteries not included).NOTICE:Do not expose to excessive heat, keep away from fire.Not recommended for children.Remove batteries when not in use.Keep dry, do not wash.Use gentle, Don't pull/crush wires or lay objects on it, flowingRegularly check the electricity, and replacement of new batteries timely. 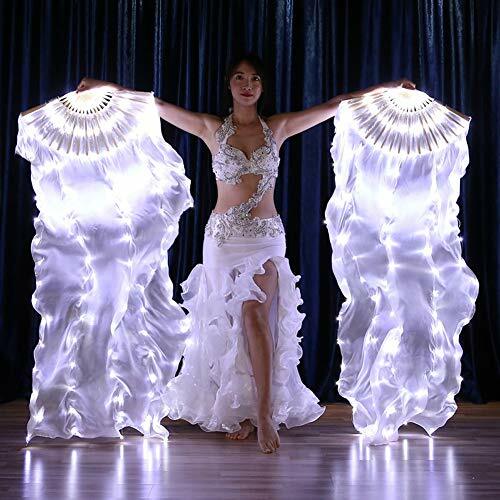 Unique design,Safe low voltage,Easy to use.Perfect for Belly dance,shows,annual fancy-dress rave,carnival,stage, Halloween party,Christmas outfits,photography etc.HOW TO USE:Put the lithium batteries into the battery case, then turn on the led light, enjoy your stage.Type: belly dance led fan veil Colour: WhiteMaterial: 100% Silk, Natural Strong Bamboo.Size: about 180cm*90cm.Attention: No batteries, Hand made items, Do not wash.NOTICE:Do not expose to excessive heat, keep away from fire.Not recommended for children.Remove batteries when not in use.Keep dry, do not wash.Use gentle, Don't pull/crush wires or lay objects on it, flowingRegularly check the electricity, and replacement of new batteries timely. 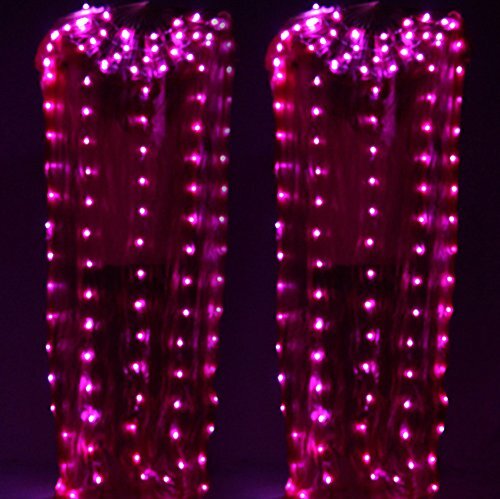 NAME:Belly dancing LED silk fanSIZE: The bamboo ribs length 11.8 inches (30cm),The silk veil's length 16.9 inches (43cm）,The silk veil's width 22 inches (56cm).Unique design,Safe low voltage,Easy to use.Perfect for Belly dance,shows,annual fancy-dress rave,carnival,stage, Halloween party,Christmas outfits,photography etc.HOW TO USE:Put the lithium batteries into the battery case, then turn on the led light, enjoy your stage.Type: belly dance led fan veil Colour: ColorfulMaterial: 100% Silk, Natural Strong Bamboo.Size: about 43cm * 56cm.NOTICE:Do not expose to excessive heat, keep away from fire.Not recommended for children.Remove batteries when not in use.Keep dry, do not wash.Use gentle, Don't pull/crush wires or lay objects on it, flowingRegularly check the electricity, and replacement of new batteries timely. 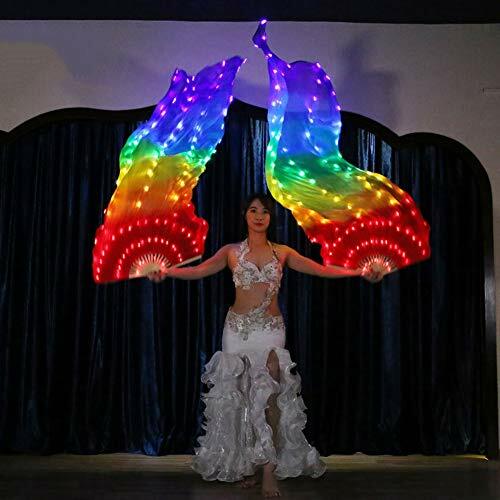 WHAT YOU GET:2 x Belly dancing LED silk fan( Batteries not included).